In an endeavor to create a difference and bring the homeland close to Telugus, the New Jersey Telugu Association (NJTA) was established. It has decided to come up with regular activities and during its inception a month ago, it brought in the likes of Devi Sri Prasad, Dil Raju, Nikhil Siddhartha and others. Now, NJTA came up with their second event which turned out to be a huge success. 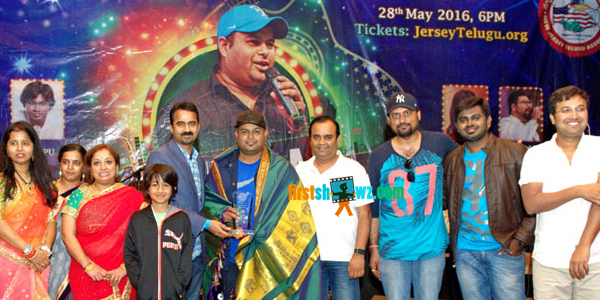 This was the live concert of noted music director S S Thaman accompanied by Geeta Madhuri, Sri Krishna, Sameera, Deepu and Deepak. The venue was Woodbridge High School and it was a houseful with more than 1000 audience. A total of 25 songs were performed nonstop and it kept the audience on their feet with a lot of energy and excitement. The event also had felicitation for the local prominent business personalities. Later, Thaman and his group were felicitated by the NJTA committee consisting of Chinna Vasudeva Reddy, Mohan Pendyala, Manju Bhargava, Swathi Atluri (Gundapuneedhi), Veni Chinna, Anuradha Arun, Ujwal Kasthala, Sarala Komaravolu. From his end, Founder and President Chinna Vasudeva Reddy was thankful for making this event a big success despite short notice. Committee also thanked iDream Media and Pinakin Studios for partnering with and giving this opportunity to host the event in New Jersey. "Apart from hosting this kind of gala events, we also started a monthly magazine named Sirivennela to stand as a bridge between United States of America and Telugu States of India. Legendary poet Sri Sirivennela Seetarama Sastry garu wished us all the best for naming the magazine Sirivennela, the title originally conceived by Sri K Vishwanath garu", added Chinna Vasudeva Reddy. Now, NJTA is gearing up for its third event and this time it is going to Parthu Nemani’s Semi Classical and Film music classes. All in all, NJTA’s path is moving towards new horizons.